With the recent proliferation of water shortages caused by wonky weather patterns, finding ways to maximize the water we do have has become a focus of preppers near and far. That said, in addition to knowing how to find, harvest, purify, and store water, it is important to develop a lifelong habit of conserving water. The bottom line is that careful water conservation methods will allow you to make the most of limited supplies not only following a disruptive event but also day to day as you learn to make do with what you have during a drought. Today I share 16 ways to conserve water in in your home. We’ll begin in the bathroom since interestingly enough, that is where 75% of all household water is used. 1. Do not keep the bathroom faucet running. The faucet at the bathroom sink does not need to be running continuously while you brush your teeth, wash your face, or shave. You will save between three and five gallons of water each minute your faucet is turned off. That is a lot of water! Instead, use the stopper on the sink and drain the basin when you are done. 2. Only flush when needed. The toilet is not a wastepaper basket for tissues, cotton balls, or other bits of trash. Even better, flush the solids every single time but alternate flushing the liquids. The prepper’s motto is ‘yellow, let it mellow’, ‘brown, flush it down’. 3. Flush using less water. Most toilets installed before 1980 use 5 to 7 gallons of water per flush. Toilets installed between 1980 and 1993 use 3.5 gallons per flush. Toilets installed since 1994 use 1.6 gallons. If you happen to have an older toilet, consider filling a used soda bottle or jar with water and small pebbles or marbles and place it upright in the tank. This will cut down on the amount of water that flows through the tank with each flush. Just be careful not to place the bottle where it will jam the flushing mechanism. Also, make sure you don’t displace so much water that you have to double-flush. Double flushing wastes more water than you would save. 4. Check for leaky faucets and toilets. It is easy to replace worn washers and since a small leak can waste many gallons of water a day, it is well worth the effort to test for leaks now. The way to test for toilet leaks is to put a few drops of food coloring in the tank to see if the colored water appears in the bowl. This takes about 10 minutes. If the water color changes, you have a leak. Not to worry, though. Most leaks can be repaired with a kit that you can pick up at your local hardware store or on Amazon. You can find a lot of information on toilets and toilet repairs at the Toiletology 101 website, including a free course on toilet repairs. Keep in mind that little leaks can add up quickly. A faucet drip or invisible toilet leak that totals only two tablespoons a minute comes to 15 gallons a day. That’s 105 gallons a week or 5,460 wasted gallons of water a year. Are you wondering how long the parts in your toilet tank should last? The answer is: it depends. Replaceable parts such as flappers and washers or seals inside the refill valve may last several years. However factors such as water treatment processes, toilet bowl cleaners, and high water pressure can cause parts to disintegrate much sooner. If you touch the flapper and get black “goo” on your hands, the flapper needs to be replaced. 5. Check for hidden water leaks. Check for hidden water leaks elsewhere in your home by reading your water meter. What you do is read the house water meter before and after a two-hour period when no water is being used. If the meter does not read exactly the same, there is a leak. Bathing and showering consume huge amounts of water. One good way to conserve is to turn the water off while you soap up. I get too cold doing that so instead, I have installed a water saving shower head. Another option is to limit the length of your shower to 5 minutes or less. Reducing your shower time by only 1 minute can save up to 1,000 gallons of water a year. 7. When you take a bath, use lots of bubble bath. I kid you not. Stop up the tub, add a copious amount of bubble bath and add just a few inches of water. It is totally an illusion but it will seem as though the water is higher than it really is. In addition, remember to plug the tub before turning on water; that initial burst of cold water will be warmed later by adding hot water. 8. Refrigerate drinking water to keep it cold. Like your drinking water cold? Keep a bottle or carafe of drinking water in the refrigerator so that you do not have to leave the faucet running while getting a cold drink. Personally, I prefer my drinking water a room temperature. 9. Use kitchen water wisely. In the kitchen, don’t let the faucet run when you scrub vegetables or prepare other foods. Put a stopper in the sink instead. Likewise, do not use running water to thaw meat or other frozen foods. Defrost food overnight in the refrigerator or place it in a bowl of hot water instead. Instead of using a garbage disposal that requires running water to operate, start and use a compost pile. Your garden will love you for it. Here are 80 things you can compost that might surprise you. 11. Be prudent when preserving pipes in freezing weather. Most people know that you can leave some water running in order to prevent pipes from freezing in cold weather. Except for the most extreme of situations, all you need is a very thin trickle of water running to accomplish that goal. 12. Use your washer and dishwasher for full loads only. When doing laundry in a washing machine, run full loads only. The same applies to dishes in a dishwasher. Hint: Instead of pre-washing dishes before putting them in the dishwasher, spray them with a mixture of Dr. Bronner’s Magic Soap and water (3 tablespoons per quart of water). Sponge or brush off the excess food, perhaps using a bit more of your spray. No additional water is needed. Want to save some money? Make up a batch of DIY Liquid Castile Soap and use that instead. 13. Install inexpensive faucet aerators in your bathroom and kitchen. If you can bathe your whole body with a showerhead that uses less than 2.5 gallons per minute, why use up to 7 gallons just to wash your hands in the sink? An inexpensive faucet aerator that supplies 2.5 gallons per minute should be fine in the kitchen. In the bathroom, a 1-gallon-per-minute aerator will provide plenty of water to brush your teeth, wash your hands. 14. Water plants deeply but less frequently. When watering your plants, deep soak each time you water. Many people water lightly and frequently, causing a shallow root system. Watering deeply and infrequently creates a healthy root system that is better equipped to withstand heat and drought. Also, use watering cans, whenever possible, especially when watering just a few patio plants. Watering with a hose may actually put more water on the patio than in the containers as you move from plant to plant. Even better, If you must use water on your outdoor plantings, consider using rain water or a grey water system. 15. Use buckets of water instead of a hose. Use buckets when washing your car instead of letting the water from the hose run continuously. Your vehicle will become just as clean and when you are done, a quick rinse will whisk away the final remnants of dirt. This same process works with washing outdoor furniture, patios, and just about everything else. This last tip came from a Backdoor Survival reader. Here is what he said. Living in Texas, during this drought, I heard an excellent idea to conserve water. While taking your shower, place a 5-gallon bucket (readily available at any home improvement store) in the tub with you, right by the drain. As you shower, some of the water will end up in the bucket, instead of going down the drain. Curious to see how you are doing when it comes to water conservation? I found this nifty home water audit online at the Water Use It Wisely website. It only takes a moment to complete and you might be surprised at the results. I actually scored 31 out of 36 but then again, where I live the water cost is about a dollar a flush so I am extra careful when it comes to water. Like so many things in life, the use of water can be a mindless process mired in habit. However, many places in the US, particularly the state of California, are undergoing an epic drought. Heck, even my home in lush, green, Washington State is in a state of drought. This is not only affecting the availability of drinking water, but also the much needed supply of water to support agriculture. Whether you live is a drought state or not, the lack of water is going to seriously affect the cost of food for a long time. Right now, when you turn on the faucet, there it is: fresh, clear water. But after a disruptive event? Not so much. If you are lucky, you will at least have some water and if not, let us hope that you will have plenty of water stored away and that you will have learned in advance to be miserly in its use. In closing, most of the tips outlined today apply to a “situation normal”. After all, a bubble bath would be out of the question following a disaster. On the other hand, the habits you develop during normal times will carry you forward with the proper mindset when faced with a survival “do or die” situation. During those times, your supply of water will be limited to the amount that you’ve been able to store. Plus, if your are acquiring the water yourself, it is a lot of work, carrying in buckets of water and then purifying them. Either way, normal times or not, you do not want to waste a drop. Bargain Bin: Below you will find links to the items mentioned and related to today’s article. Faucet Replacement Aerator Kit – 3 Pack : It is often the simplest of things that can end up saving a ton of both water and money. Fluidmaster 400CR Toilet Fill Valve and Flapper Repair Kit : Speaking of water, this is one of those items you don’t think of stockpiling but believe me, we now have a couple in reserve for emergency purposes. Why fuss with adjusting a tank valve when you can replace the whole thing for less than $12 and 10 minutes of your time? Dr. Bronner’s Magic Soaps Pure-Castile Soap: Of all of the Dr. Bronner’s castile soaps, peppermint is my favorite. I use it to make “Peppermint Magic”, an all purposed cleaner. 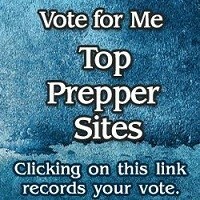 The Prepper’s Water Survival Guide: Harvest, Treat, and Store Your Most Vital Resource: You can survive up to three weeks without food, but only three days without water! When catastrophe strikes, having enough water can spell the difference between life and death. This book by Daisy Luther offers a step-by-step plan with straightforward information you can easily follow. Suncast RB50D 50-Gallon Rain Barrel : A rain barrel is a great way to collect water for, well, a rainy day. This is the rain barrel I own. The instructions indicate that it must be dumped regularly to prevent algae formation but since I will be using this “free” water in the garden, it will get replenished regularly by Mother Nature. That said, I am definitely going to keep an eye on things. DryTec Calcium Hypochlorite, 1-Pound : This is 68% Calcium Hypochlorite. As of this writing, the price is under $10 with free shipping. I purchased Ultima Pool Shock which is 73% Calcium Hypochlorite. For more information, read How to Use Pool Shock to Purify Water. LifeStraw Personal Water Filter : The LifeStraw is considered the most advanced, compact, ultra light personal water filter available. It contains no chemicals or iodinated resin, no batteries and no moving parts to break or wear out. It weighs only 2oz. making it perfect for the prepper. For more information, see my LifeStraw review. Enjoy your site since George Ure turned me onto it. We live in So. Florida, high humidity, use a portable AC unit for our bedroom at night so we can leave the house AC off and the patio door open for the dog. Every morning we have at least 3 gallons of water in the bucket the AC drain hose empties into. Not a lot but better than nothing. Would have been useful after hurricane Wilma left us without water for a week and power for 10 days….We have solar for critical items, fridge/freezer/pool pump so should be in pretty good shape when/if the next one hits. BTW, whenever I need to defrost something fast, rather than heat up water to put it in, I just set it out on the patio table in the sun, works like a charm. George and I have been best buds since 1971. We still spend an hour talking via Skype once of twice a week. Great article! We are in southern California where the drought is bad. But the article raises a question about something I always hear: wash only full loads of laundry. My washer has unlimited settings for the water level; it’s a dial with a continuum, not simply “high, medium, low.” Should I still be concerned about washing only full loads? I know it uses electricity to run a small load, but I also line-dry almost every load, and I have only limited space for my line. Plus, we have solar electric panels to offset the electric use (and it’s probably also offset by not using the dryer). If the only concern is saving water, is it really bad to wash a small load when you can set the water level appropriately? thanks for any thoughts! Common sense would tell me that you are blessed to have a washer that lets you set the water level. I personally have an HE washer which does not use a lot of water, but still, there is no adjustment so I usually wait until I have a full load. Install a hot water recirculation system. Saves LOTS of water. Try replacing some (or all) of your showers with sponge baths. I have found them to be faster and easier, and they use far less water. Although you’ve been conditioned to think otherwise, you’ll get just as clean. You’ll HAVE to take sponge baths if the power goes off.